Today is DIY TIPS AND TRICKS! I’m with some of my favorite bloggers sharing our best home decor diy tips and tricks! Make sure to check out my friend’s ideas at the end of this post! Now, let’s talk about these fun, updated sheer curtains! 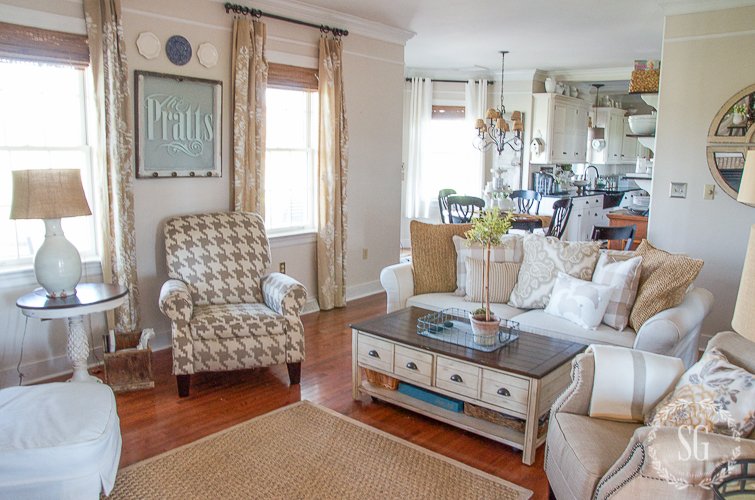 Here are the curtains I had on the family room windows before… They are linen and I painted them with chalk paint a few years back. However, they have gotten limp and need a good dry cleaning and starching! And here’s my updated shears! 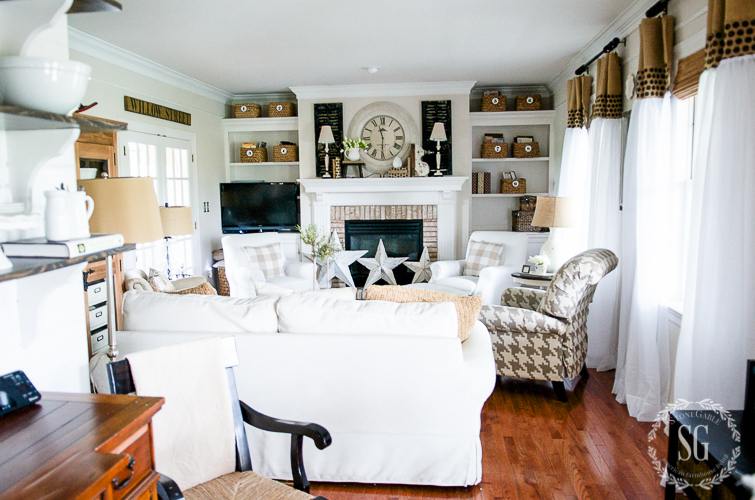 I think the sheers totally changed the look of my family room! I made all four panels for under $40.00. Yes!!!! What a bargain! The sheers came from WalMart and cost $4.87 a panel (I’m doing my happy dance, you just can’t see me). I bought 8 panels because I used 2 sheers per panel. They are wonderfully made and worked perfectly. The burlap came from my “burlap box” so it cost me nothing! Don’t you love a great bargain? It took less than an hour to make each panel and hang them. If you can sew a straight line, you can make these. And here’s another great thing about these updated sheers, you can also use this technique if you have curtains that are too short for your windows! My ceilings are 9 feet and the sheers I bought were 84 inches. They worked great for adding extra fabric to the top of them. Let’s make some very cute, updated sheer curtains! 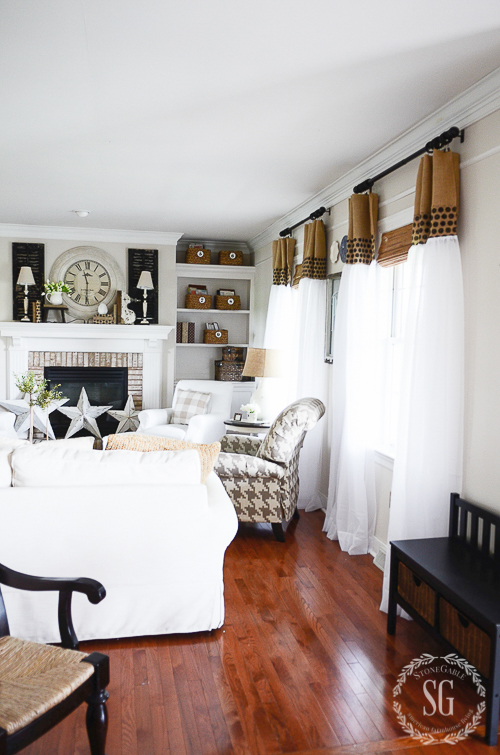 The length of sheers and the amount of burlap you will need is specific to your window. Just measure carefully. You might want to work this all out on paper before you begin. It’s pretty easy, but I like to double check everything… Remember, measure twice, cut once! Scissors, measuring tape, sewing machine. First measure how long you want your curtains to be when they are finished. You will need to figure out how long you want your top border to be and how long your sheers will be. Be sure to calculate seam allowances into your measurments. I used 1/2 inch seam allowences for all seams. Cut the plain burlap first. Cut one length of plain burlap 1 and 1/2 times as wide as your window and as long as you have determined for the top of your curtain. Remember to add in seam allowances. Next, cut the patterned burlap the same width as the plain burlap and as long as you want it to be. Again, add in seam allowances. 2. Putting right sides together sew one long raw edges of the plain burlap to one raw long edge of the patterned burlap. Use a 1/2 inch seam allowance. 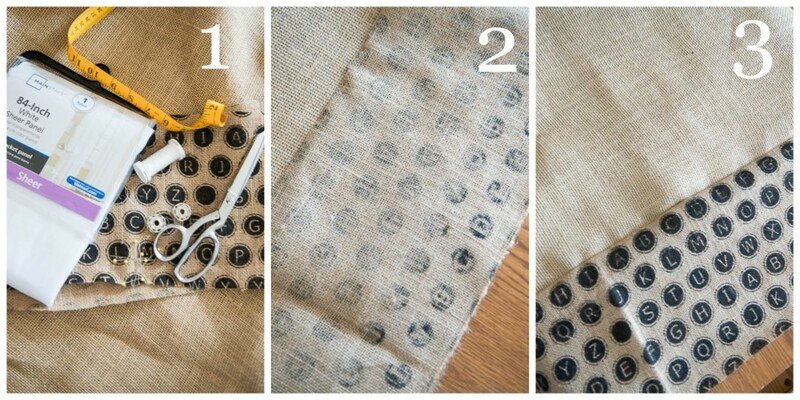 If you are using a burlap with a print on it make sure that when the pieces are sewn together that the print is right side up! 3. Open up the burlap and press the seams. This is the top part of your curtain. Now, turn over 1/2 inch of burlap along the top long length of plain burlap to the wrong side and sew to have a finished seam. Finish the edges on the two width sides like the top (instructions above). 4. Calculate how long you need the sheer curtain to be and add 1/2 inches. Cut the curtain to the proper length, if needed. You will need 2 sheers for 1 curtain panel. Sew a long stitch seam 1/2 inch below the top of the sheer curtain. 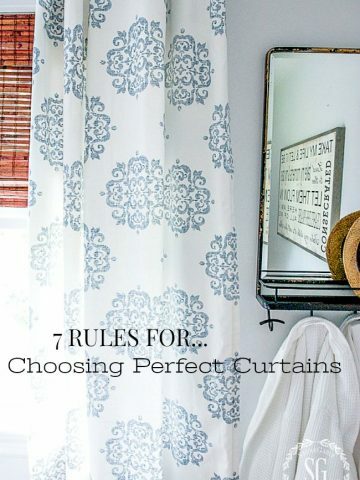 Gather the curtain and pin it right sides together with the edge of the printed fabric. YOU WILL ONLY PIN IT TO HALF OF THE WIDTH OF THE CURTAIN. Follow direction 4 again using a second sheer panel. You will have 2 gathered panels and pinned them to the right side of the printed fabric along the edge. Sew them together using a 1/2 inch seam allowance. Done!!! I love sheer curtains and their ability to lighten and brighten up a room. Perfect for spring and summer! 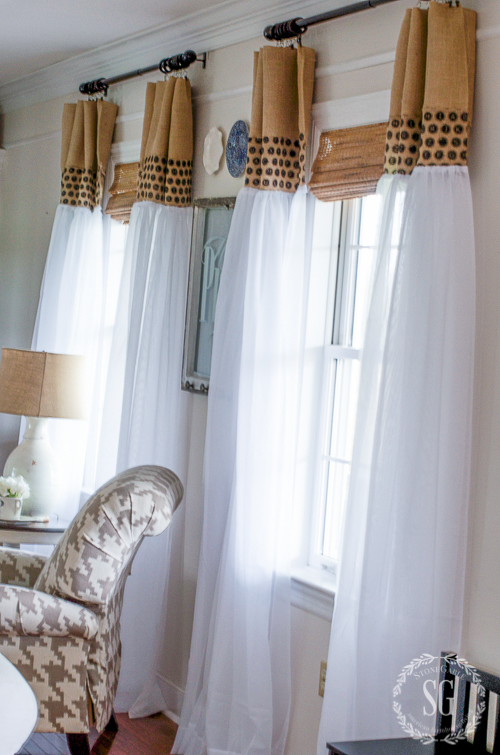 Are there some windows in your home that need pretty new, upscaled curtains? Why not make them sheer! 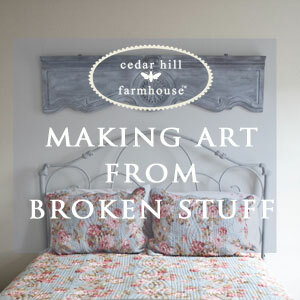 Please visit my great friends and sew what amazing tips and tricks they have for you! You might like to follow me on Pinterest and see all the great things I’m finding to pin every day HERE! I found this fabric at JoAnne’s fabric. Not sure if they carry it anymore. This is just what I was looking for. For clarification, the 2 sheer panels will not be attached on the side seams? They will just flow? I adore your burlap and sheer curtains! Can you please tell me where you got the burlap? Hi Cindy, the burlap came from JoAnne Fabrics a few years ago. I love these and can just envision the breeze blowing through these in the spring. I’ve pinned these for my master bedroom refresh. Thanks for all the Wonderful ideas………..
Love the Burlap and sheers! 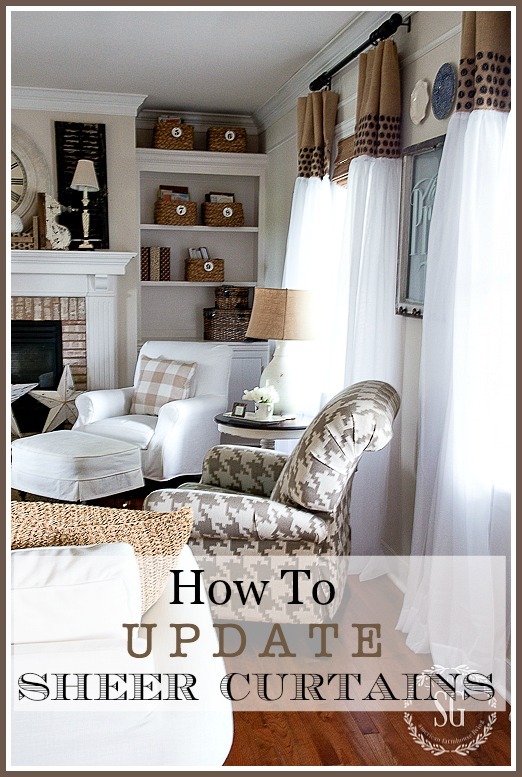 Great inspiration to update my living room curtains! Thank you for this excellent idea for updating sheers. 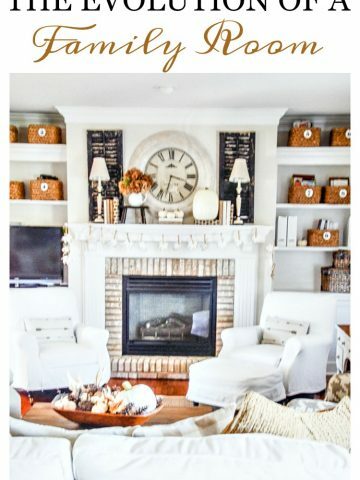 I will be using these ideas for my family room. Oh my gosh I’m absolutely in LOVE with this idea. 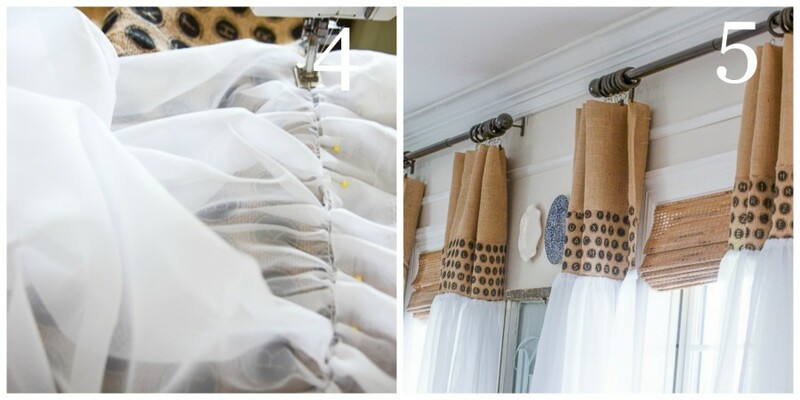 I’m putting up sheers in my living room and this just gave me an awesome idea! Thank you! I made drop cloth curtains for my master bedroom but they don’t puddle on the floor as much as I’d like them to. Since I made my shower curtain with the French themed burlap this company makes, I think I’ve found my solution. 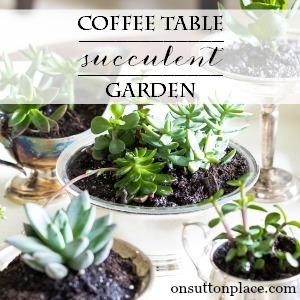 Thank you so much for sharing this marvelous idea! Thank you for the inspiration! I made something similar this weekend. It was just what my kitchen needed! The sheers with the burlap at the top look amazing. I would never have thought of doing that. Very creative Yvonne!! I love this idea! I have sewn a border to the bottom of curtains to make longer, but never at the top of sheers. You are just too clever for words, Yvonne! Love the combination of sheers and burlap! Looks like I’m going to have to get on the “Burlap Train”. Where did you get the printed burlap? Hi Anna! I bought the printed typewriter burlap at JoAnne’s fabrics. They have great printed burlap. Hope this helps! Well of course! Now I know how to give those sheer curtains in the master bedroom the snappy eye appeal that was so lacking. I was studying them the other day wondering what to do to make the window treatment more interesting. I could only come up with what Scarlett O’Hara always said: ” I will think about that tomorrow.” And now I don’t have to. Yvonne with her creative genius has come to the rescue! I absolutely love that look! Thank you for the wonderful solution. Perfect! It’s always a joy to see what you have up your sleeve for us all! Hope you never tire of blogging. So many fans! I never would have thought to mix the two but its fabulous! Reminds me of a gown with a flowing skirt. LOVE! Yes, I does look like that. Isn’t that pretty? 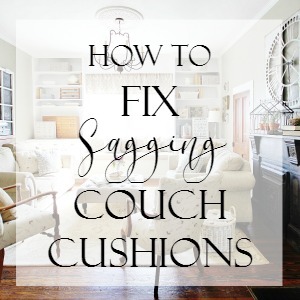 Question – what is the best way to deal with throw pillows when people want to sit on the sofa? Hi! I keep a big basket in each room and the pillows in there. Some people like to snuggle into them and that’s okay too. Love the juxtaposition of burlap and sheer…beautiful. Great idea and so unexpected! Thanks for the idea, they look fabulous in the room! 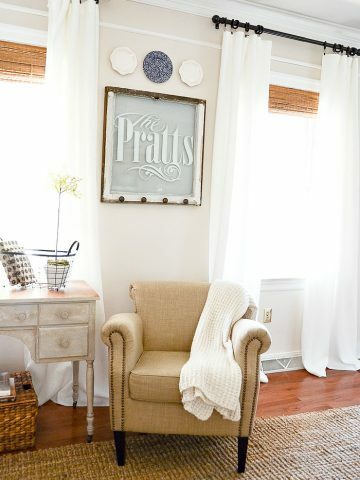 Would love to know where you got your neat “The Pratts” framed on your wall! The “Pratts” window was a gift. I don’t know where it came from. Sorry! We are redoing my husbands office and I have gray blue sheers, but I really like them and want to continue to use them. I was going to make blue buffalo check pillows for the couch, and now I can add the check to the top of the curtains. 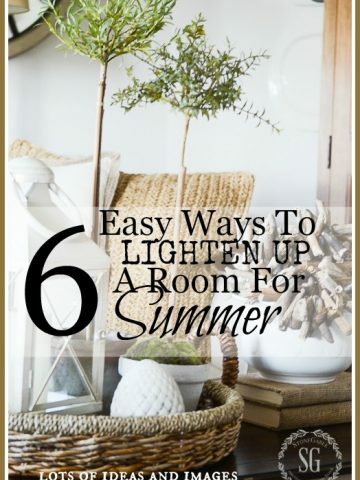 Wow – what a great way to lengthen sheers and add a new look to the windows and room. Thanks so much – time to get out the sewing machine. Yvonne I absolutely love them! Thank you for a wonderful idea! Another great project! Absolutely the best idea yet! LOVE LOVE LOVE!!! You are the best! Thank you so much for sharing!!? Thanks for the sweet encouragement! There Beautiful unique and one of a kind there gorgeous . Another superb idea from you! Clever and unusual, adding softness and interest while tying all aspects of you room together.